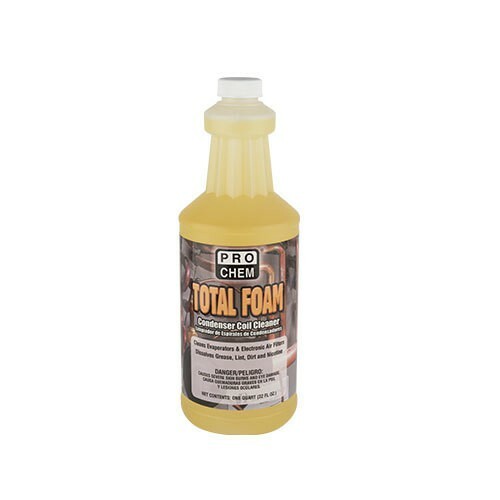 Total Foam | Pro Chem, Inc.
TOTAL FOAM is an alkaline-based, nonacid concentrate that can be diluted 1 part product to 3-4 parts water, depending on how tough the job is. It penetrates the coils as a liquid and turns to a heavy foam after about 20 seconds to lift away grease, oxides and contaminants, leaving the coil fins smooth and bright. This product is biodegradable and phosphate free. Since it is odorless, it is an ideal replacement for standard, highly fuming coil cleaners. Goggles, gloves and other protective clothing should be worn when using this product. Turn off system. Dilute 1 part TOTAL FOAM with 3 or 4 parts water. Add water to a low-pressure tank sprayer, then add cleaner. Concentration can be increased or decreased depending on job requirements. Spray solution directly onto coil, starting at the bottom, saturating thoroughly. Rinse thoroughly after foaming has ceased. Allow longer contact for the removal of heavier grease accumulation. DANGER: Causes severe skin burns and eye damage. May be corrosive to metals.